Romesco sauce is a popular topping in Spain. It hails from the Catalonia area of Spain and appears with roasted vegetables, fish or slathered on a crostini. While in Spain I grew to love crostini with Romesco....so yummy, especially with a nice glass of wine! 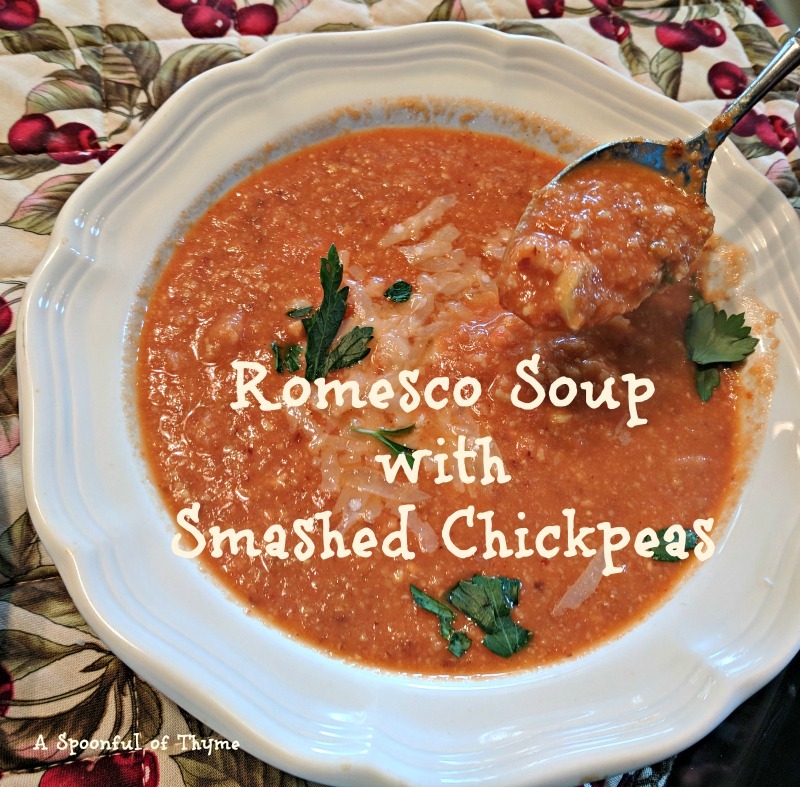 This Romesco soup is a variation of the sauce. 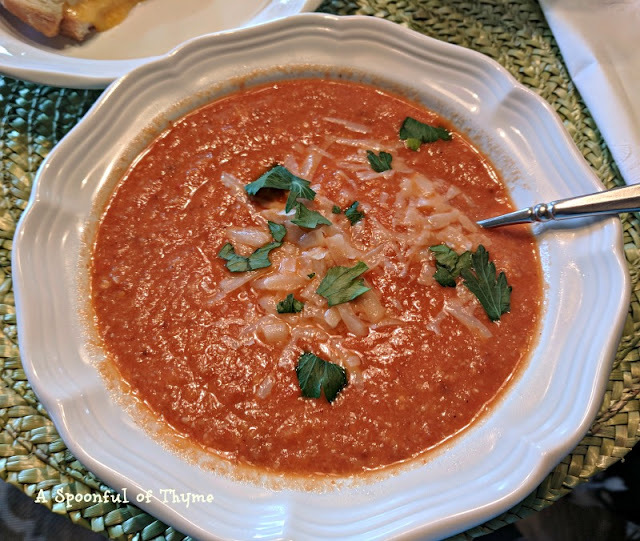 It has all of the great ingredients: roasted red peppers, garlic, tomatoes, and almonds with some vegetable broth and a few surprises tossed in. One of the surprises is harissa paste. I usually have powdered harissa on hand but paste has more complex and depth of flavor than the powder. (Thank you, Amazon...you saved me miles of driving.) So when it was suggested that harissa paste be used, I was willing. The other surprise is chickpeas. This soup has smashed chickpeas in it. These, along with the almonds, give a nice texture to the soup. It is called Spanish Romesco Soup with Smashed Chickpeas! Today is Saturday Soup Swappers and I was challenged to make a soup using almonds. I usually associate almonds with baking so I had a little thinking and working to do. Today's theme was selected by Sneha at Sneha's Recipes. Thank you, Sneha, for reminding me that there many ways to use an almond! Line a baking sheet with foil. Arrange peppers on one side. On the other side spread the almonds and garlic. Place in oven. Roast almonds for 12 minutes. They will be golden brown and slightly cracked. Remove the almonds from the baking sheet and set aside. Continue roasting the garlic for 7-8 minutes. Remove and set aside. Return the baking sheet to the oven and increase the temperature to 475° F.
Roast the peppers until they have blackened, about 12 minutes. Turn the peppers midway to char the other side. Once charred, remove the peppers and place in a paper bag or wrap in foil to allow them to steam for about 3-4 minutes. After steaming the peppers, peel away the skin, remove the core and the seeds. Remove the skin from the garlic. Put the peppers, garlic, almonds, tomatoes, vinegar, harissa, paprika, salt, pepper, and maple syrup into the blender. On high speed, puree the ingredients until smooth. Scrap down the sides of the container as needed. Taste and adjust the seasonings as desired for additional heat, sweetness, acidity or salt. Pour the mixture into a large pot. Add the vegetable broth and the smashed chickpeas. Bring the mixture to a simmer over medium heat, then reduce and simmer on low for approximately 15 minutes. Ladle the soup into bowls and garnish as desired with chopped cilantro and parmesan. This was an enjoyable soup. 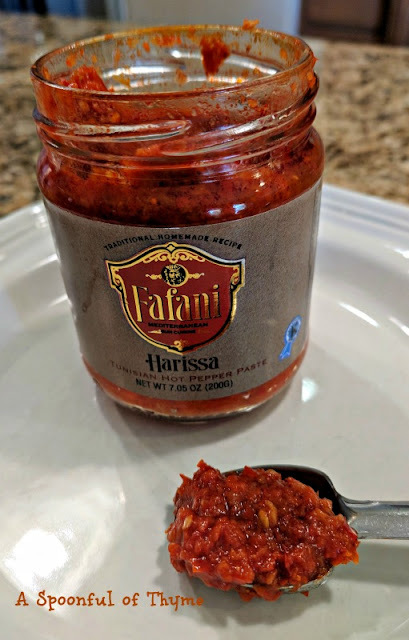 I loved the spiciness and depth of flavor from the harrisa paste. And I am so thankful to have the air conditioning unit up and running! Ten days without air conditioning is a very long time. Once the house had cooled down....on came the oven to roast those gorgeous peppers, garlic cloves and almonds! !